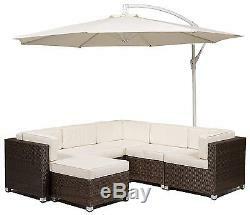 Savannah Corner Sofa Garden Rattan Set. The set is made using special UV resistant PE rattan in a light and dark brown mixed weave. The frame of the set is Aluminium making it rust resistant. Beware of cheaper imitations using normal steel frames that are painted; these are not resistant to rusting and will corrode after prolonged contact with the elements. The set is fully compliant with UK fire regulations for upholstery making it safe for indoor use. The set comes complete with 8 luxury padded back cushions and 10cm thick seat cushions, all with an upgraded shower proof coating. Every cushion cover is removable, making the set easy to maintain. The coffee table features a 5mm tempered glass top and also comes with interchangeable cushion so you can use it as extra seating or a footstool if needed. Your garden seating arrangement just wouldn't be complete without a parasol to provide cooling shade on those extremely hot days. This set comes with a massive 3m free standing cantilever parasol with wind-up'crank' mechanism for easy use. The parasol fits perfectly behind the sofa to create a cooling canopy. When it's not needed simply wind the crank handle to fold the parasol neatly away. We recommend bringing the cushions in doors when not in use and using the cover to keep dirt and leaves off your new set during the winter months as well as keeping the set extra dry. Please Note: This set must be completed with 4 concrete slabs to provide a counterbalance for the parasol. Ideal for Indoor or Outdoor Use. PLEASE NOTE: Due to the size and weight of this item we are unable to deliver to the following postcodes: BT, AB, GY, HS, IM, IV, JE, KW, LD, ZE, PA, PH, DD. The item "Rattan Corner Sofa Set Garden Outdoor Furniture Savannah" is in sale since Thursday, June 26, 2014. 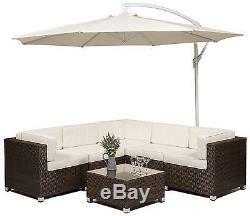 This item is in the category "Garden & Patio\Garden & Patio Furniture\Other Garden & Patio Furniture". The seller is "modern-furniture-direct" and is located in Birmingham. This item can be shipped to United Kingdom.